Our Design Ecology comprises of diverse skill sets bound by a strong core strategy. Our team works with passion, verve and an entrepreneurial spirit to deliver innovative solutions right from developing strategy to completing a superior creative expression across all Design vehicles. We work with brands to boost their social media presence in the most efficient manner and develop strategies to drive brand awareness, leads and revenues. This presence is customised and diversified across all relevant social network channels for the brand, making sure the right customer sees your content on the right platform, at the right time. Your website and app are key platforms that you can use to showcase your brand to potential clients, customers and partners. In order to develop the best experience for your brand online, we create tailored, interactive experiences that are in line with your brand narrative and are exciting to engage with for the end user. It’s a pretty simple formula… more visibility = more traffic = more potential customers = more sales. Whether you’re building a new website or optimising your existing site, as your business growth partner we ensure that your brand is seen. Our expertise includes competitor analysis, keyword research, audience segmentation and both on and off-page SEO. The best prices and the highest reach will take your brand places. We bring consumers closer to brands through connections across all paid platforms. 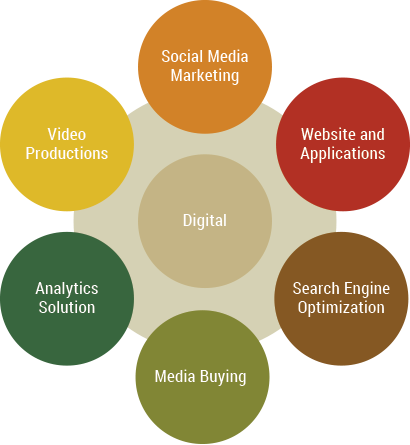 Our team Strategises to help you build your digital media inventory through intelligent targeting, negotiation and purchasing ad placements based on the product/service being advertised, your target audience and business goals. Data is indisputable, however leveraging it requires analytical research, skill and knowledge, as well as access to the latest tools. With our insightful and regular analytics, you’ll get a holistic understanding of your brand’s performance in the digital world, as well as data to drive future initiatives. In the ever-changing digital landscape, methods of using video as a medium to communicate are constantly evolving. Unique, high quality and engaging content are some of the most important ranking factors for your brand, and our content marketing specialists can help produce the right video for every communication need. We leverage and power digital advertising from interruptions to interactions for the end consumer.